Saskatoon is known for its many bridges, but it’s also home to various statues. And now the city wants people to know the history behind those statues. Walking around downtown Saskatoon, various landmarks stand out such as the Mahatma Ghandi statue. Some might wonder why it’s here. But there is a reason behind it according to Kevin Kitchen, community development manager with the City of Saskatoon. The bust was commissioned at the request of the Saskatoon India-Canada Cultural Association and was installed at the corner of 21st Street and Third Avenue in 2000. Kitchen said the city’s statues are meant to represent its various communities. The Ukrainian community has a statue of famous Ukrainian poet Lesya Ukrainka. Patrick Hayes, an archives technician at the University of Saskatchewan, said the statue was donated to the university by a Soviet group. Hayes said it makes sense for Saskatoon to have a statue like this in Saskatoon because the city has a vibrant Ukrainian community with many tracing their ancestry to that region of the world. 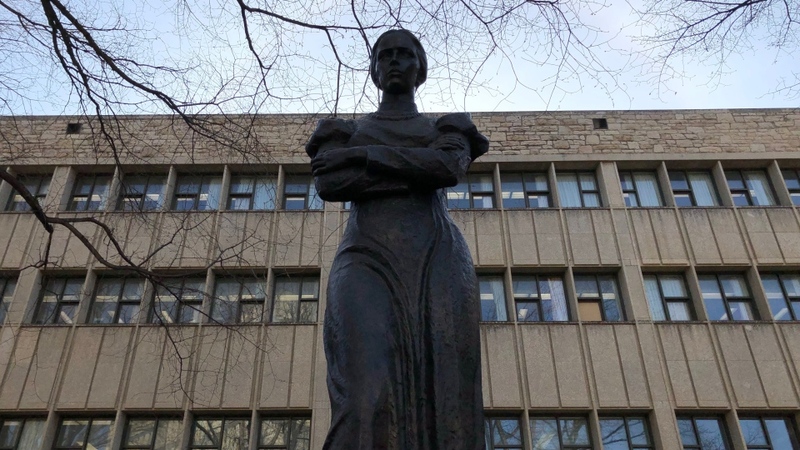 “It is very important having a big figure like this, very central on campus that people walk past every day,” said Nykola Dovgyy, president of the Ukrainian Canadian Students’ Association at the U of S.
Some of these little-known stories can now be found on an electronic map on the city’s website. Another statue that may be a familiar sight is the Egg Money statue located near the Farmer’s Market at Sonnenschein Way and Avenue B. This sculpture was commissioned by the Saskatoon German Days Committee and was created by artists Don and Shirley Begg. It is one of 17 public art statues in the city. “It tells the story of the contribution that women, in particular immigrant woman made to farming and market garden farming in Saskatoon. So it tells a story that otherwise might not be told,” Kitchen said. That’s the point of it all – to tell the city’s story, according to Kitchen. Kitchen encourages members of the public to go out and learn about the city’s history by interacting with its 50 statues and finding out about the stories of its communities and people.